Includes AC Adapter and Ethernet cable. Trending at $145.00eBay determines this price through a machine learned model of the product's sale prices within the last 90 days. The inside coverage will be various base on the outside signal level, 1-2 bars can cover reach 500-800sq. ft, 3-4 bars can cover reach 800-1000sq. ft, 4-5 bars can cover 1000-1500sq. Choosing us and live a better life ! AT&T 4G LTE Signal Booster Cell Phone Repeater Cricket 700MHz Band 12 /17 N Type. 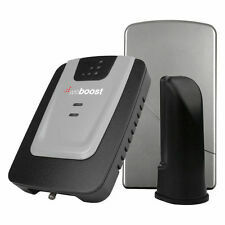 This Cell Phone Signal Booster mainly improves your Data signal and calling quality. Outdoor Antenna captures signal from Tower, the antenna coaxial cable will then transfer that signal into the house where the amplifier will boost it to 4-5 bars. Wilson Electronics' most affordable 4G signal booster for vehicles. When everything you do doesn't improve your situation, trust in a Wilson Electronics cell phone signal booster, an industry leader in wireless communications with over 40 years of reputable engineering and assembly. Frequency : 700MHZ Band 12 /17. 1 AT&T Cell phone Signal Booster LTE 700Mhz. This AT&T Cell Signal Booster aim to improve your AT&T FDD-LTE Data signal and calling quality. The antenna coaxial cable will then transfer that signal into the house where the amplifier will boost it to 4-5 bars. AT&T Microcell Cisco DPH154 Wireless Cell Signal Booster. •AT&T Microcell Cisco DPH154 Wireless Cell Signal Booster. iiiiiiiiiiiiiiiiiiiiiiiiiiiiiiiiiiiiiii FREE SHIIPPING !!!!!!! AT&T CISCO MicroCell DPH-154 Wireless Cell Phone Signal Booster! 5 out of 5 stars - AT&T CISCO MicroCell DPH-154 Wireless Cell Phone Signal Booster! 46 product ratings46 product ratings - AT&T CISCO MicroCell DPH-154 Wireless Cell Phone Signal Booster! CellSpot Unit. Supports up to 16 active users with 8 active users on 3G/4G UMTS and 8 active users on 4G LTE respectively. Cat5 Ethernet Cable. Quick Start Guide. Hour of Operation Wall Mounting Kit. This Cell Phone Signal booster kit aims to improve your AT&T Cell Service Data signal and calling quality. Outdoor Antenna captures signal from Tower, the antenna coaxial cable will then transfer that signal into the house where the amplifier will boost it to 4-5 bars. LCD GSM 900MHz Cell Phone Signal Repeater Booster Amplifier Yagi Antenna Kit Features: The cell phone signal repeater supports GSM900 network, it supports any wireless operator in the frequency range of 890-960 MHz. Equipped with 9 meters 9dB Outdoor Yagi Directional Antenna, suit for areas where Wireless Operator's Mobile Network Signal is weak. Equipped with 3dB Indoor Antenna, signal coverage could reach up to to 150m2 without obstacle, it is the best choice for small house. No need to use extra accessories, just plug and use. Functions: High gain, easy installation and operation. Full-duplex, single-port design. Use ALC technology, adjust extent automatically LED Light Working & Signal Condition Indicators Big linear power,. 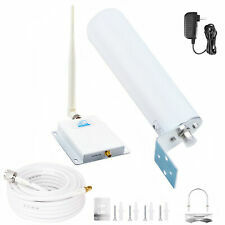 Yagi / Ceiling Antenna 850Mhz AT&T Verizon Cell Signal Booster Amplifier GSM CDMA 3G 4G LTE Band 5. This Cell Phone Singnal Booster Phone Repeater is designed for Verizon AT&T U.S. Cellular, The network frequency is on 850MHz of Band 5. AT&T 3G MICROCELL. IT GETS REALLY EXPENSIVE! THE ITEM IS YOURS. DO NOT REQUEST OR DEMAND DOUBLE BOXING, I WILL DO IT AT MY OWN DISCRETION. Trending at $97.00eBay determines this price through a machine learned model of the product's sale prices within the last 90 days. 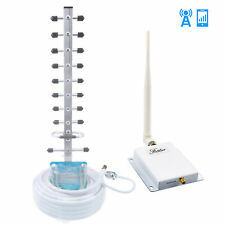 1 Set LTE 4G GSM 2G 850/1900MHz 70dB dual band signal booster repeater antenna. Diy Kits GSM 900 4G LTE 1800 (FDD Band 3) Dual Band Repeater 70dB Gain GSM 900 DCS 1800mhz Dual Band Amplifier Repetidor Celular. SAMSUNG NETWORK EXTENDER SIGNAL BOOSTER SCS-2U01 for Verizon Wireless Network. Condition is excellent.Shipped with USPS Priority Mail. Photos shows overall condition. Boosts voice & data speeds including 4G LTE. Outside Mini Magnet Mount Antenna. Inside Ultra Slim Antenna. - Amplifies the signal up to 4 devices in your vehicle. Drive 4G-M. Vehicle Power Adapter. We are always willing to work out any problems. 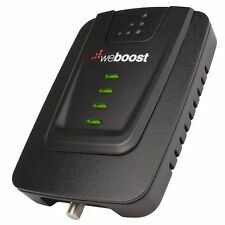 SIGNAL BOOSTER: The weBoost Drive 4G-M Cell Phone Signal Booster boosts your 4G LTE and 3G signal up to 32X for fewer dropped calls, higher audio quality, and faster uploads and downloads. IMPROVED QUALITY: Get fewer dropped calls with weBoost cell phone signal boosters while improving voice quality as well as upload and download speeds on your 4G LTE and 3G device. The following is from the web site Enhanced indoor coverage: Supports both voice and data up to 5000 square feet. Supports up to ten voice or data users simultaneously. Simple setup process using quick setup guide - Note that you must have an official AT&T account (not a 3rd-party carrier or pre-paid). 5,Automatic adjust the system gain to avoid the repeater self-excitation. 1,Booster X1. 2,User manual X1. 3,Automatic dormancy when no user make the calling. If frequency doesn't match, it can't works. Trending at $46.66eBay determines this price through a machine learned model of the product's sale prices within the last 90 days. HiBoost 4K LCD. 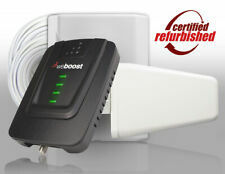 HiBoost cell phone boosters strengthen signal to any cellular device or hotspot within range – patching up dead zones, boosting data uploads and downloads, improving call quality and allowing more comprehensive talk and text coverage. 470210 is composed of 470510 304415 4G OTR Truck Antenna Spring Mount. 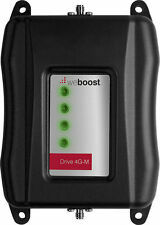 Drive 4G-X Booster. 15 ft. cable. 4G-OTR Antenna. Boosts voice and data. Kit includes. This is the booster only (as you can see from the pictures). This is to insure your item arrives safe and secure. Signal Repeater Size: 140 100 20mm/5.51 3.94 0.79". Connect outdoor antenna to "BTS" port in repeater machine through cable. Fix up outdoor antenna reception on housetop and point to signal tower. LED Light Working & Signal Condition Indicators. Trending at $35.94eBay determines this price through a machine learned model of the product's sale prices within the last 90 days. COMES AS SHOWN! Acquired from a reliable source. No means to test. No cords included. 1. We are surplus equipment dealers and do not have the ability or knowledge to test equipment for functionality beyond plugging it in and describing what we observe as best we can. 2 You are purchasing used equipment – most is untested as stated in our description. Please reach out to us directly if there is a problem. We are quick to respond and resolve. NO REFUNDS OR RETURNS are given for parts/repair items or freight items. Used items have a 30-day return. 3. Trending at $31.74eBay determines this price through a machine learned model of the product's sale prices within the last 90 days. It can technically be used for RV and other large vehicle types but coverage is limited to small front seat space or wherever slim interior antenna is placed. Once fitted, the Drive 4G-X OTR will enhance the signals. Reduces dropped calls, extends signal range and increases 4G data rates. Need a better cell signal?. We have you covered. Our new design includes an LCD display so installation and troubleshooting are easier than ever. We include everything you need for easy set up with zero fuss. 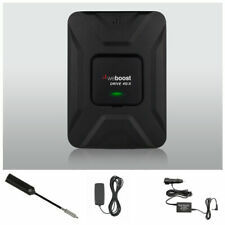 HiBoost F10G-5S-LCD Signal Booster. It can also support large capacity use for up to 100 cell phone users. An alarm and ISO LED will alert you to any system problems.Features. 4G Voice and Data. LCD display.